Kurumba art is a unique tribal art form found in the Nilgiris. It was discovered by the C.P.Ramaswami Aiyar Foundation and presented to the world. Eluthu paarai is an ancient 3000-year-old rock-art site in the Kothagiri region of the Nilgiris. The Kurumbas – a tribe of hunters and medicine men – believe that the art were the work of their ancestors. Developments of the twentieth century have resulted in the Kurumbas losing their forests, thereby losing their traditional skills. In the late 20th century during the course of a project of the C. P. Ramaswami Aiyar Foundation to survey and document the art and craft traditions of four Nilgiri tribes, the existence of an old artist - the only one left in the tribe – was discovered. There were no takers for his art and he now painted the walls of the temple only once a year, during the annual festival. The Foundation, with the support of the Ministry of Tribal Affairs, Government of India, funded the old man to teach his grandson Kitna their art traditions. In turn, Kitna taught another 20 Kurumba youth their own art traditions. 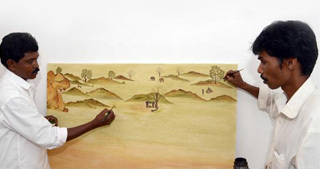 C. P. Art Centre’s artist Y. Venkatesh went from Chennai to teach them to paint on paper, hold a brush and use natural, water or poster colours. Till recently, they did not have any skills to earn a lawful income. Today, Sundapatti and Velleri Kombai - which cannot be accessed by road, the nearest being 2½ kilometers away - are filled with Kurumba artists. 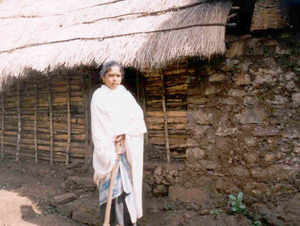 The art are primarily ritualistic, describing various facets of tribal life in the remote forests of the Nilgiris. We see the Kurumba huts built of leaves and wood, women drying foodgrains, men collecting honey, weddings and rituals, earthen pens for hens, and wild animals prowling the forest. The Kurumbas love the hills and have an exquisite style of art. Originally, they drew with burnt twigs and coloured the art with a resin extracted from the bark of the Kino tree (Pterocarpus marsupium). Some of the art still use this method, which is slow and cumbersome, but beautiful. On paper, they have learned to use water and poster colours, which flow easier.